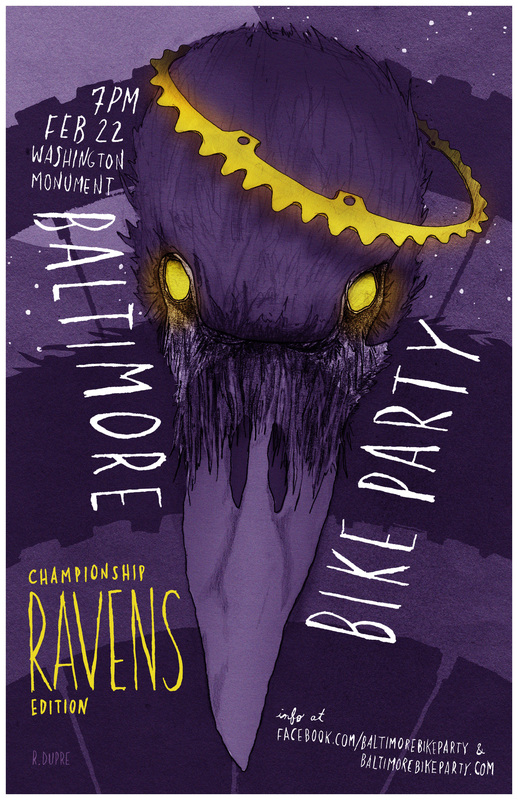 Hey Everyone, be sure to join us this month as we celebrate our Championship Ravens! No matter how big or small of football fan you are, we can all hop on the I-love-Baltimore feel-good train! So put on your purple-est hat shirt socks gloves lights horns cowbells and glowsticks and join us Feb 22nd for this month’s Bike Party festivities! As always, meet at the Washington Monument in Mt Vernon at 7pm! This month we will be ending at Little Havana for the usual festivities. also Ryan Dupre will be selling limited edition prints of this month’s poster!